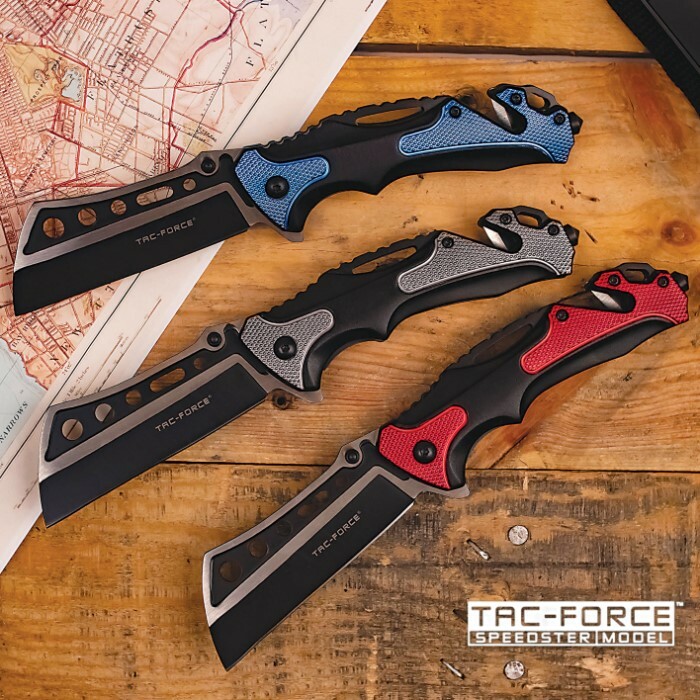 Tac-Force Rescuer Pocket Knife - 3Cr13 Stainless Steel Blade, Two-Tone Anodized Aluminum Handle, Glass Breaker, Seat-Belt Cutter | BUDK.com - Knives & Swords At The Lowest Prices! The Tac-Force Rescuer Pocket Knife is an emergency tool that you can count on. The pocket knife has a two-toned, 3 1/2” 3Cr13 stainless steel Wharncliffe blade with weight-reducing thru-holes. The blade can be quickly deployed using the thumbstuds to smoothly activate the assisted opening mechanism. The handle is two-toned anodized aluminum with textured insets, and it features a glass breaker and seat-belt cutter. The 8” overall, pocket knife is 5”, when closed, and it has a sturdy black stainless steel pocket clip for ease of carry. This assisted opening pocket knife is available in the colors blue, red and grey.